В результате исследования проб перифитона из Филинского болота были обнаружены зигоспоры восьми видов десмидиевых водорослей (Bambusina borreri, Closterium acutum, C. cynthia, C. incurvum, Hyalotheca dissiliens, Micrasterias rotata, Penium spirostriolatum, Staurodesmus extensus var. rectus). Приводятся описания и световые и электронно-микроскопические фотографии зигот. Ключевые слова: десмидиевые водоросли, болота, Московская область, зигоспоры десмидиевых, desmidiales. Various researchers have studied the different aspects of the flora of algae in bogs of Moscow region, these researches were conducted at different times. There are known works focused on the general lists of algae (Levkina et al., 1984), correlation of a list of algae and physical and chemical conditions of a bog (Dune, 1928), distribution of plankton in a bog (Korschikov, 1928). Some of them are devoted to conjugates (Conjugatophyceae, Streptophyta) of bogs of Moscow region (Anissimova et al., 2009; Anissimova, Terlova, 2014, 2015; Anissimova, 2013; 2015) precisely, showing that the desmid flora of this region is rich and interesting. It was shown that the architecture of zygospore’s surface could be used as an important taxonomical feature in order to distinguish species (Hoshaw, 1980, 1985). Thus this information is significant for the system of conjugates. The formation of zygospores by desmids is rare in nature. For some species their zigospores are either unknown or the information on their morphology is scanty. There are studies of zygospores of desmids from the water pools of different regions: French Guiana (Coesel, 1974; 1998), Framce (Kouwets, 1987, 1988) and India (Panikkar, 2005; 2006) and others. Articles concerning zygospores of desmids in the bogs of the Moscow region do not exist yet. The Filinskoe bog is a protected area and a natural monument of Russian Federation. It is located on the edge of Moscow in the city of Khimki (55°55'N, 37°22'E). The size of the bog is approximately 600×400 m; higher plants are represented by Sphagnum sp., Eriophorum sp., Carex sp., Scheuchzeria palustris L., Poa sp., Comarum palustre L., Oxycoccus sp., Salix sp., Betula sp. There is a small oligotrophic lake in the middle of the bog. Samples were collected on May 2013 (temperature of water was 15-17°С, pH 6,8, conductivity was 122 µS/cm) and June 2014. (temperature of water was 19-21°С, pH 4,7, conductivity was 38 µS/cm). Algal material was collected by squeezing out the surfaces quagmire on two stations. Shortly after sampling the material was fixed with FAA (formaldehide:acetone:ethanol as 2:1:1). The temperature and pH of water and mineralization were measured. Material was studied by a light microscope (Leica DM-1000) and a scanning electron microscope (SEM) (Jeol JSM-6308LA). 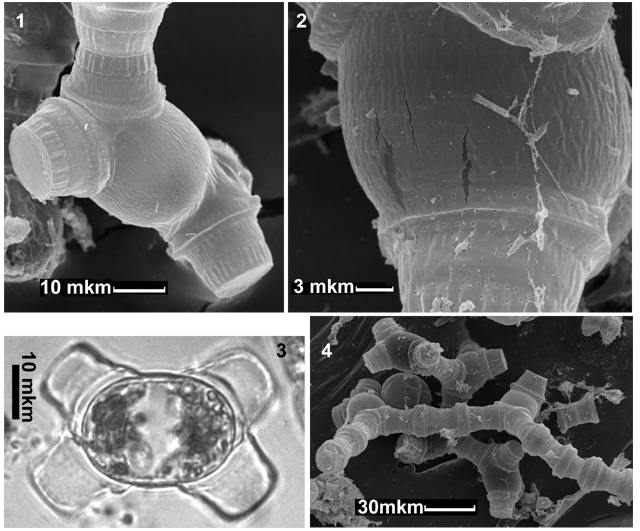 The specimens for SEM were prepared using the method described by O.Anissimova (2014). During the study the zygospores of eight desmids species were revealed. The original descriptions of desmids zygospores of the Filinskoe bog are following. Bambusina borreri Kützing Fig. 1‑4. Cells are cylindrical, swollen near the sinus. Cell length 28-35 μm, breadth 24-26 μm. A conjugational channel between two cells is very short. A zygospore is formed in this channel and fills it completely. Zygospores are elliptical, length 22-30 μm, breadth 18-23 μm. The remains of conjugated cells are often found in 2014. The SEM examination of the zygospores revealed a single line of pores located on the baundary between the zygospore and its mother cell (fig. 2). Fig. 7‑8 ‑ C. cynthia (LM, SEM). Closterium acutum Brébisson Fig. 5‑6. Zygospores are rectangular with concave sides and extended angles. Their cell wall is smooth. Length 39-40 μm, breadth 13-16 μm. During the conjugation cells are settled in the same plane, their ends are bended towards each other. Zygospores were found in biofouling of higher plants in water in 2013 and 2014. The zygospores of C. аcutum described by F. Kouwets (1987) appeared to be longer (approximately 63 µm) and more narrow (8 µm), yet the shape and the arrangement of the cells are identical. Closterium cynthia De Notaris Fig. 7‑8. Zygospores are globular, cell wall is smooth. Diameter 24-31 μm. During the conjugation cells are settled in the mutually perpendicular planes. The remains of conjugated cells are often found in 2013. In spite of the fact that С. cynthia is a widely distributed in Europe and has been found often, its zygospore was reviled in Russia for the first time. Closterium incurvum Brébisson Fig. 9‑10. Zygospores are globular, smooth, diameter (12) 14–21 μm. During the conjugation cells settle with spine sides toward each other. The remains of conjugated cells are found in 2013. Size is mentioned for the first time for Eurasia. Hyalotheca dissiliens Brébisson ex Ralfs Fig. 11‑12. Zygospores are elliptical or globular. The conjugational channel with a zygospore inside is very wide, mother cells remain until the zygospore’s withdrawal. Length 21-30 μm, breadth 20,5-21 μm. Zygospores of H.dissiliens are found in 2013 and 2014. Fig. 17‑18 ‑ Staurodesmus extensus var. rectus (LM). Micrasterias rotata Ralfs Fig. 13‑14. Zygospores are globular, bare sufficiently long and unbranched spines on its surface. Diameter without spines (58) 113-143 μm. Lenght of spines 11-36 μm. In May, 2013 the mass development of M. rotata was observed and the abundance of its zygospores was found. Penium spirostriolatum J.Barker Fig. 15‑16. Zygospore is elliptical in width. Length 32‑58 μm, breadth 29‑53 μm. Some of them appeared to be smaller then the size indicated in literature. Staurodesmus extensus var. rectus (B. Eichler & Raciborski) Coesel et Meesters Fig. 17‑18. Zygospores are globular, with few numbers of long spines (because of which the zygospore could seem pent- or hexagonal). Diameter 15-16 μm. Lenght of spines is 6.5‑8 μm. The work is performed at User Facilities Center of M. V. Lomonosov Moscow State University under financial support of Ministry of Education and Science of Russian Federation. 1. Anissimovа О. V. Small species from genus Cosmarium (Conjugatophyceae, Desmidiales) in peat-bogs of Moscow region // News of systematics of lower plants. 2013. Vol. 47. P. 13‑20. (In Russian). 2. Anissimova O.V. 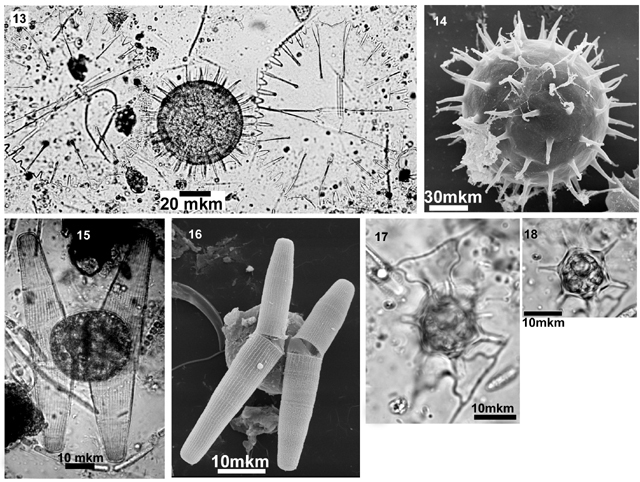 Methods of processing samples of desmids (Desmidiales, Charophyta) for scanning electron microscopy // Algae: problems of taxonomy, ecology and application in monitoring. Proc. of the 3d Intl. Scient. Conf. (Borok, 24–29 August 2014). – Yaroslavl, 2014. – P. 8-10. (In Russian). 3. Anisimova O.V. New Species of Desmids (Conjugatophyceae, Charophyta) to the Algae Flora of Moscow Region // Moscow Biological Sciense Bulletin. 2015. Vol. 70, №2. P. 31–34. 4. Anissimova O.V., Terlova E.F. Micrasterias C.Agardh (Conjugatophyceae) in bogs of the Moscow region // Issues of modern algology. 2014. №1(5). URL: http://algology.ru/476 (In Russian). 5. Anissimova O.V., Terlova E.F. Euastrum Ehrenberg (Conjugatophyceae) in bogs of the Moscow region // Issues of modern algology. 2015. №1(8). URL: http://algology.ru/665 (In Russian). 6. Anissimova О.V., Dmitrieva А. N., Kezlya Е.М. Additions to the flora of algae of the Zvenigorod Biological Station // Proc. of the S.N. Skadovsky Zvenigorod Biological Station. – 2011. Vol. 5. – P. 46‑52. (In Russian). 7. Coesel P.F.M. Notes on sexual reproduction in desmids // Acta Bot. Need. 1974. Vol. 23, №4. P. 361‑368. 8. Coesel P.F.M. Desmid zygospores from French Guiana and the phenomenon of simultaneous conjugation in multi-species assamblies // Cryptogamie. Algol. 1998. Vol.19, №1‑2. P. 109‑119. 9. 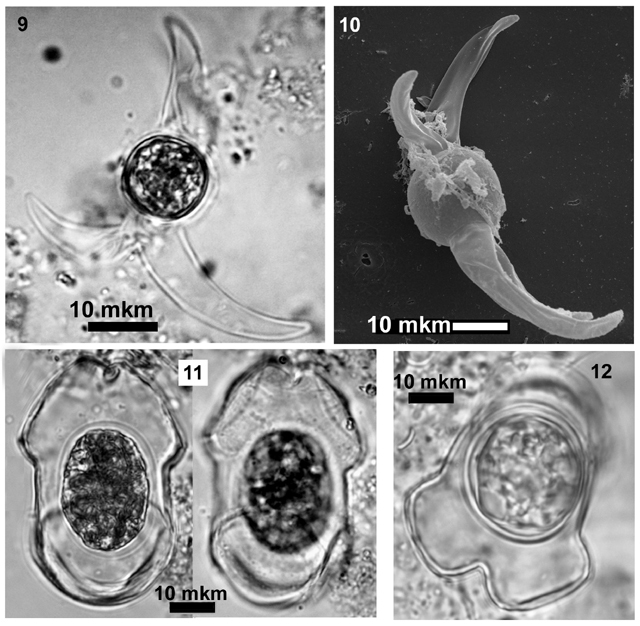 Dune E. Some biological data of plankton from torfy career «Sima» with the relation to physico-chemical conditions // Proc. Zvenogorodskoy Hydrophysics Station. Application of physical chemistry to the study of the ecology of fresh water. – 1928. – P. 366‑379. (In Russian). 10. Hoshaw R.W. Systematics of the Zygnemataceae (Chlorophyceae). 11. Zygospore-wall structure in Sirogonium and a taxonomic proposal // Journal of phycology. 1980. Vol.16. P. 242‑250. 11. Korshikov А.А. Some data of the distribution of algae and flagellates in the Lutzinskoe bog // Proc. Zvenogorodskoy Hydrophysics Station. Application of physical chemistry to the study of the ecology of fresh water. – 1928. – P. 404‑420. (In Russian). 12. Kouwets F.A.C. Desmids from the Auvergne (France). // Hydrobiologia. 1987. Vol. 146. P. 193‑263. 13. Kouwets F.A.C. New and noteworthy desmid zygospores from South-West France// Acta Bot., Neerl. 1988. Vol. 37, №1. P. 63‑80. 14. Panikkar M.V.N., Krishnan S. Zygospore formation of desmids from Kollam district, Kerala (India) // Feddes Repertorium. 2005. Vol. 116. P. 218-221. 15. Panikkar M.V.N., Krishnan S. Zygospore formation of four rare desmids from Kerala, India // Feddes Repertorium. 2006. Vol. 117. P. 277-279. 16. Šťastný J. Desmids (Conjugatophyceae, Viridiplantae) from the Czech Republic; new and rare taxa, distribution, ecology // Fottea. 2010. Vol. 10, №1. P. 1‑74. 17. Levkina L.М., Sizova Т.P., Uspenskaja G. D. Algaeflora of the Volkovskoe peat-bog, Moscow region // Moscow Biological Sciense Bulletin. 1984. Vol. 3. P. 39‑42. (In Russian). 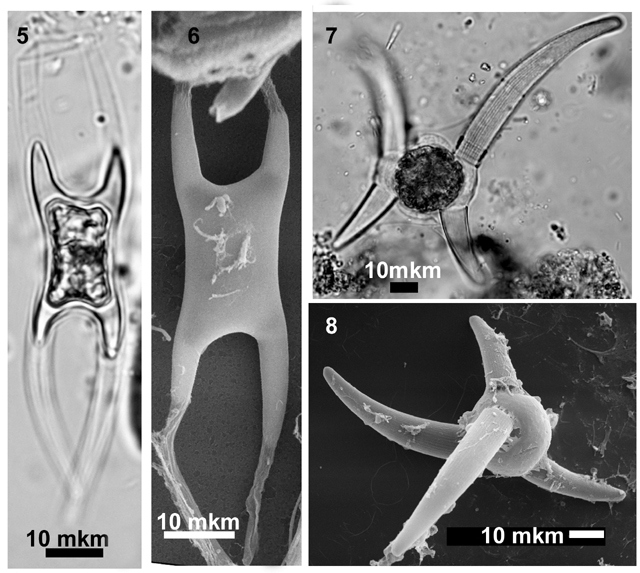 Several samples of periphyton from the Filinskoe bog appeared to be characterized by a high level of the sexual reproducing stages of desmids. The zygospores of eight desmids taxa (Bambusina borreri, Closterium acutum, C. cynthia, C. incurvum, Hyalotheca dissiliens, Micrasterias rotata, Penium spirostriolatum, Staurodesmus extensus var. rectus) are described using light and scanning electronic microscopes.